The NordicTrack C 700 Treadmill has been updated this year and combines a lower price with a high quality frame, motor and other sought after features. One of the many standout features is the price at $799.00 along with the ability to incline at a push of a button, being iFit enabled, and being able to handle the weight of a 300 lb user. This treadmill also includes other high end features like extra cushioning to help reduce impact while running and being able to be stored folded when not in use. The C 700 treadmill fully setup is 73" long by 36" wide and 67.5" tall. The deck size that you walk and run on is wider than normal at 22" and it is 55" long. The tread belt revolves on a 1.9" roller that is of commercial quality and non-flex which helps extend the life of the 2.75 horse power motor. With this quiet motor you can walk, jog and run at continuous speeds from 0.5 to 10 mph. You can also adjust the cushioning of the treadmill to reduce impact stress on your knees and hips. The firm setting simulates running on a hard surface like a road. This treadmill ramp folds up to the console saving space using EasyLift telescoping shocks for one hand lifting. The console has multiple LED displays that shows information like calories burned, heart rate, current incline, speed, distance and time. There is also a calorie burn rate bar at the top which shows the intensity level of your workout. You can increase or decrease the desired burn rate by pressing the appropriate buttons. Doing this will modify the speed and/or incline of your treadmill. The weight settings you entered for your user profile will also affect how the burn rate is calculated. On the left of the console is a vertical row of buttons allowing you to jump anywhere from 0 to 10% incline with a push of 1 button. On the right side you control the speed from 1 to 10 mph. In the middle of the console you can select one of the 20 built-in exercise programs which are grouped into 3 categories. You can also control the fan speed and volume for the built-in speakers which can be used by your mp3 and iPod music player. At the base of the console under the fan you have your start and stop buttons along with duplicate increase and decrease controls for your incline and speed. To start using the C 700 Treadmill make sure the power switch is on and then stand on the rails of the treadmill (the 2 frame parts that are on either side of the tread). Attach the safety clip to yourself and then insert the key into the console. The lights of the console will then turn on. To use the manual mode you then select the Manual button and then enter your weight. Your weight is used to calculate the Calorie Burn Rate bar during your workout. You can then hit the start button. The treadmill will start at 1 mph. You can then step on the tread and start walking. The speed increase/decrease buttons will change the speed in 0.1 mph increments or 0.5 mph increments if held down. You can also use the quick buttons on the right of the display to change your speed from 1 to 10 mph in just 1 button press. You can also change your speed this way that includes a decimal by pressing 2 numbers in quick succession. Your treadmill incline works in a similar way as the speed control except you can use the quick buttons on the left of the display. Press your desired incline (as a percentage) and the treadmill will automatically slowly increase or decrease until the desired incline is reached. To measure your heart rate you can use a compatible Bluetooth smart heart rate chest strap (not included) or the heart rate monitor built into the treadmills front hand grips. To measure your rate you will need to grasp the grips with both hands for about 15 seconds for an accurate read. Avoid moving your hands when measuring and when a pulse is detected it will be displayed on the console in beats per minute. When you are finished working out you can press the stop button. If you plan to fold the treadmill make sure that the incline of the treadmill is set for zero as if it is not the machine could be damaged. You can then remove the key from the console and turn the power switch to the off position. It is also advised by NordicTrack to unplug the treadmill when it is not in use as this will protect the electronic components from premature wear. This NordicTrack treadmill has 20 built in workout programs. The workouts are broken into 3 categories called Incline, Intensity, and Speed. The workouts in these categories automatically control the speed and incline of the treadmill as it takes you through the exercise program. The programs are broken into segments with each segment representing a time duration, speed, and incline of the treadmill. The display will show the time remaining for the workout along with the current incline and speed. You can change the incline or speed during the workout program but once you start the next segment they will go back to the specified values from the program. Workout programs can be paused and will finish when the timer reaches zero or you press stop. The Custom-Focus Weight Loss Workout is a separate program of the C 700 and is based on your own workout time or calorie goal. Just press the number of calories you want to burn and then start. You can then modify the speed and incline of the treadmill to your desired settings and the workout will not finish until your calorie or time goal has been reached. 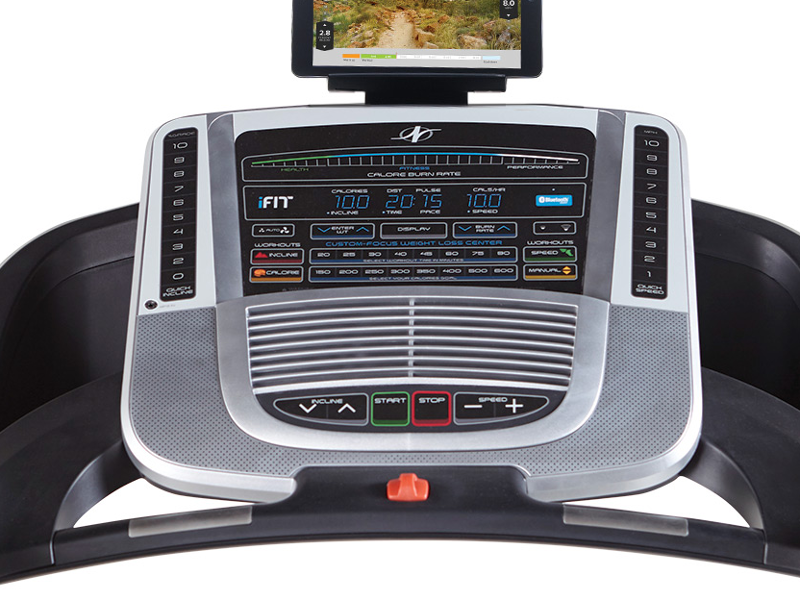 The NordicTrack C 700 Treadmill supports BlueTooth connections to the iFit app from your smart device. Once iFit is connected to your treadmill it will record and track your workout information. It can also control your treadmills speed and incline when you run workout programs available from iFit. The app also allows you to create your own exercise programs based on routes you design from Google Maps. iFit is available on iTunes for iOS and on Google Play for Android. Once you install the iFit app and created your free account, follow the on screen instructions to connect your smart device (like a phone or tablet) to your treadmill. Once it is connect a LED light on the C 700 console will flash blue. You then confirm the connection by pressing the BlueTooth button on the C 700 which will then update the flashing to a solid blue. Your order will arrive at your doorstep usually in about 2 weeks. It takes about 2 to 4 business days to get the order ready and then the rest of the time is shipping. Shipping for the NordicTrack C 700 treadmill is free. This is an estimated savings of about $200. 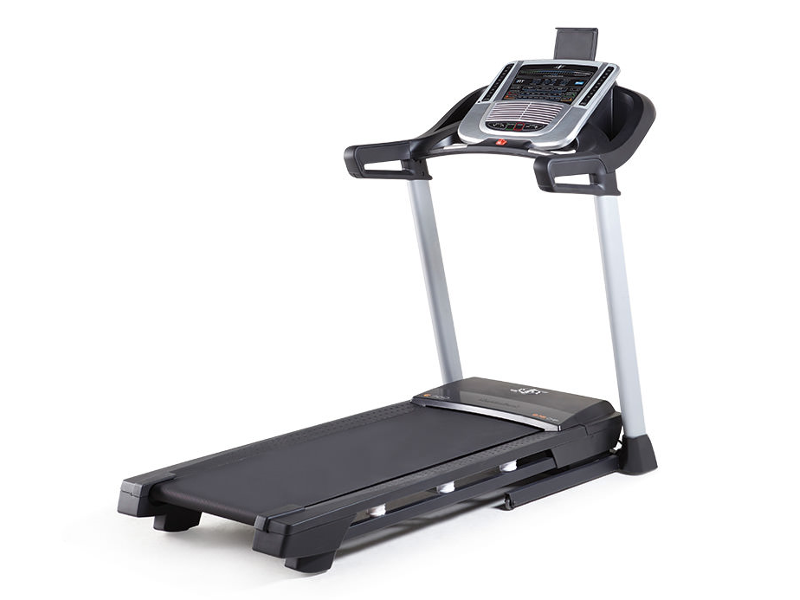 The NordicTrack C 700 costs $799 USD and comes with free shipping. * All prices are in USD unless specified other wise. Prices, coupon codes, products offered, and product features last checked May 04, 2016. If you receive a defective machine you can return it for a full refund or exchange. If you are not satisfied with the C 700 for other reasons you can return it within 30 days of receiving the treadmill for a full refund minus a 10% stocking fee and the cost of the return shipping. The NordicTrack C 700 Treadmill has a lifetime frame warranty, a 25 year motor warranty, and a 1 year parts and labor warranty. NordicTrack support is available by toll free phone and online chat during business hours. You can also contact customer service via email and online web form. NordicTrack support site also includes a frequently asked questions page and a manual downloads section. You can register your C 700 on the support site and order any parts you may need. NordicTrack's YouTube channel contains many how to videos about their line of treadmills. This includes videos on tensioning, lubricating and alignment of the walking belt on a treadmill. When setting up this unit you will need 2 people to carry it as it must weight about 200 pounds. Also remember to insert the key when starting it up. I almost had a heart attack when I plugged it in the first time to try it out and it didn't start. We bought this treadmill from Nordictrack to replace our old one we bought at Walmart a few years ago. The motor burned out of it and for the money we figured we should get a good quality treadmill which is why after some research we decided on Nordictrack. I am glad we did as the treadmill is very solidly built. The top console is easy to use and my wife and are are very happy. This treadmill is also much quieter than our old one.